In this Aug. 8, 2016 file photo, Alabama Chief Justice Roy Moore speaks to the media during a news conference in Montgomery, Ala. Under the “progressive” leadership of Barack Obama and his like-minded “social justice” warriors throughout all levels of government, we have entered an era of lawlessness unprecedented in American history. This is no more apparent than in Alabama where Chief Justice Roy Moore of the Alabama Supreme Court has been unlawfully removed from the bench at the hands of liberal activists on Alabama’s Court of the Judiciary (COJ). The case is under appeal. This miscarriage of justice was carried out at the behest of the left-wing extremist Southern Poverty Law Center (SPLC), an anti-Christian activist organization that seeks to undermine, if not extinguish altogether, the free exercise of religion as guaranteed by the First Amendment to the U.S. Constitution. The facts of the case are clear and beyond dispute. Chief Justice Moore was arbitrarily removed from the bench for a “2016 Administrative Order [that] was merely a status report of a pending case before the Alabama Supreme Court,” notes Mat Staver, chairman and founder of Liberty Counsel. “The order did not change the status quo. It did not create any new obligation or duty. To suspend Chief Justice Moore for the duration of his term is a miscarriage of justice and we will appeal this case to the Alabama Supreme Court. This case is far from over,” he added. On September, 30 the COJ issued a decision on the trumped-up charges against Chief Moore. The Judicial Inquiry Commission (JIC) requested that he be removed from the bench. Under the COJ rules, removal requires a unanimous 9-0 vote by the members of the COJ, which is made up of judges, a lawyer and laypeople. Absent a 9-0 unanimous vote, the COJ cannot remove a judge from the bench. But, in an unbelievable violation of the law, the COJ suspended without pay Chief Justice Moore for the remainder of his term, which runs through January 2019. When his term expires, he will be ineligible to run for election as judge again because of his age. So the suspension until the end of his term is a de facto removal from the bench. This is both an unethical and illegal circumvention of the letter of the law. “To suspend Chief Justice Moore for the rest of his term is the same as removal. The COJ lacked the unanimous votes to remove the Chief, so the majority instead chose to ignore the law and the rules,” concludes Staver. The COJ’s disgraceful actions have resulted in a tremendous backlash among both the majority of Alabama voters, as well as legislators on both sides of the aisle. This has put both the SPLC and the COJ on the defensive. In a rambling screed written for AL.com, SPLC president Richard Cohen betrays his personal vendetta against Chief Justice Moore, his lack of knowledge about the U.S. Constitution and the laws of Alabama, as well as an astounding level of anti-Christian bigotry. “Moore attempted to put his personal religious beliefs above the rule of law,” writes Cohen. “The United States has always been defined by a fundamental belief in the rule of law,” he adds, evidently oblivious to the jaw-dropping level of irony and hypocrisy found within his words. Indeed, it’s little wonder the COJ knew its decision would be deeply unpopular. Most politically-motivated hit jobs are. Especially when they’re illegal. Still, the blowback has begun and legislators are moving to undo the damage to the rule of law committed by the SPLC and its COJ cohorts. “This group of individuals are not accountable to the voters of Alabama,” observed Alabama GOP Chairman Terry Lathan in a statement. “Their charge as a body is to address and make decisions on corruption cases involving judges in Alabama. At no time has this case been about corruption,” he added. “We stand by our resolution of support for Judge Moore and our resolution to call for a vote of the people regarding the election of all members to the Judicial Inquiry Commission,” concluded Lathan. 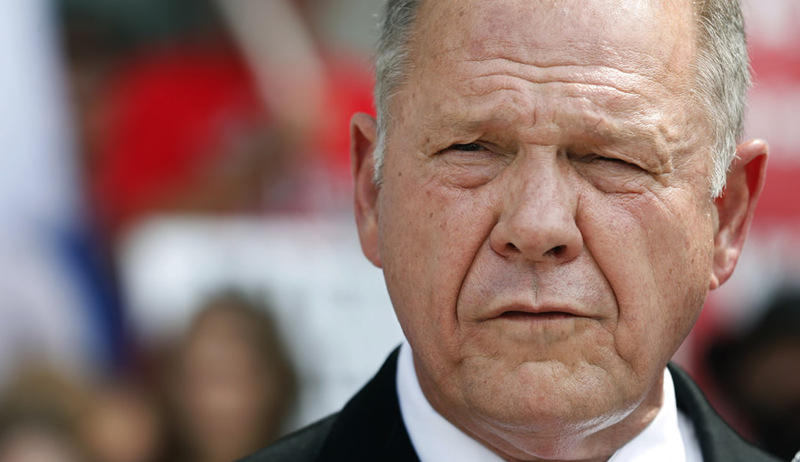 With both potential legislation and the appeal pending, the Roy Moore saga continues. Will the rule of law be reestablished in Alabama, or will politically-motivated witch hunts such as this represent the future in the heart of Dixie? If Alabama voters have any say, I expect to see justice done and this corrupt decision reversed. Matt Barber is founder and editor-in chief of BarbWire.com. He is author of Hating Jesus: The American Left’s War on Christianity, a columnist, a cultural analyst and an attorney concentrating in constitutional law. Having retired as an undefeated heavyweight professional boxer, Matt has taken his fight from the ring to the culture war. (Follow Matt on Twitter: @jmattbarber). America 2016, the immoral and indecent persecute the decent. Ancient Rome was no worse. The SPLC is out of control and needs to be dismantled ASAP! Such zionist like run organizations need to be removed from American Society as they have no civility, nor morality in their behavior as an organization. Such PIG LIKE organizations needs to be toppled so that normal civilized society may pursue its natural Rights! There are millions of Americans who subscribe to the philosophy of SPLC, including many lawyers and judges in the legal system. That is how the legalization of ssm came about. And that is why Judge Moore is likely to lose his appeal. The legal system is heavy with the SPLC types. Moore will lose on appeal as the decision to suspend him was unanimous. He should have been permanently removed the first time. We dont need judges on the bench who think they are above the law.